For 22 European teams the journey with the possible destination Men's World Championship 2017 in France already started on Tuesday when the groups for the first qualification phase were drawn in Vienna. The draw was conducted by EHF Secretary General Michael Wiederer and Martin Hausleitner, Secretary General of the Austrian Handball Federation. The teams were drawn to four groups of four teams each and two groups of three teams each. Only the top ranked team of each group qualifies for the play-offs from which nine teams will eventually qualify for the Men's World Championship. The only European nation already qualified for the 24-nation tournament is France, who are host and defending champions at the same time. 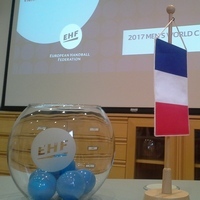 They will be joined in January 2016 by the three best ranked teams from the EHF EURO 2016, which means that overall 13 European teams will play at France 2017. The playing dates for World Championship Qualification, which is played in home and away matches, are 4 to 8 November 2015, 6 to 10 January 2016, 13 to 17 January 2016. The playing dates for the the play-offs are 10 to 12 and 14 to 16 June 2016.